A gorgeous amethyst diamond ring with a hand picked custom cut amethyst gemstone. This amethyst gold ring with diamonds is, one of the few amethyst rings that are specially designed for formal wear. The ring can be ordered as a white gold amethyst diamond ring or as an amethyst ring in yellow gold. High end craftsmanship and good gold weight make this amethyst gold diamond ring a must have for lovers of purple gemstones. Since each ring is individually made by skilled craftsmen, all ring sizes are available. 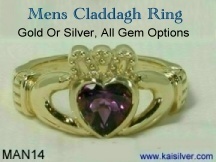 Like all other jewelry from Kaisilver, your amethyst ring can be ordered in 14k or 18k white or yellow gold with gemstones of your choice. 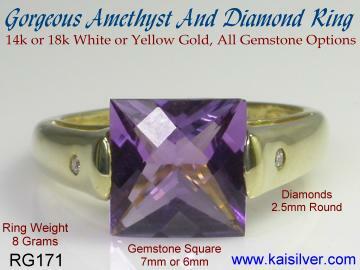 This amethyst diamond gold ring can also be ordered as a birthstone ring. The ameythst gemstone is the birthstone for those born in the month of February and represents the zodiac sign, Aquarius. As an anniversary gemstone, the amethyst represents the 6th year of marriage. If you wish to wear your diamond amethyst ring for a particular day of the week, the gemstone is worn on Wednesday. Some people prefer to wear gemstones that represent the seasons of the year. In this case your gold amethyst ring with diamond would represent the Spring season. As mentioned earlier, this ring can be ordered with all gemstone options, so you might want to look up the complete birthstone and anniversary charts. You can refer to our exhaustive birthstone chart information by clicking here for a full list of birthstone and anniversary gemstones. This is the most comprehensive list of birth stones that you will ever find. 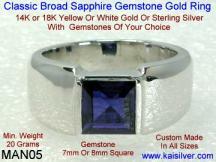 Kaisilver is one of the pioneers in online custom jewelry. We are directly networked to all leading gemstone and jewelry producers in Thailand. This massive network gives us preferential access to over 200 million carats of high quality gemstones and a base of over 3,500 skilled craftsmen. Seven top notch designers drawn from five nations work on all our orders and we do not indulge in high pitch sales talk. All our efforts are directed at helping you make a well informed decision, even if the final order does not come to us. The amethyst diamond gold ring has a square amethyst gemstone in the center. The diamonds on the side of the ring are 2.5mm rounds and provide a good highlight for the band of the ring. The mounting for the diamond is done without the use of prongs, as prongs tend to stick in clothes and might also scratch the skin on the fingers. These are critical design features that other jewellers rarely pay attention to. This gold ring with amethyst and diamonds is designed with you in mind. The center square amethyst gem stone is of size 7mm or 6mm depending on the gemstone selected and you can see complete details on the table shown below. Advice on wearing this ring: You can order this amethyst gemstone ring with diamonds, in 14k or 18k white or yellow gold. We would suggest 14k gold because of it's hardness, but the final choice will be yours. It is advisable not to wear this ring when doing a lot of physical activity. The amethyst gemstone is a special cut gemstone and the design lays emphasis on revealing the complete beauty of the gemstone. Wear this ring for formal occassions and store it safely once you are back home. If you prefer to wear this ring for daily wear we would suggest a minor design modification where, the gemstone is bordered entirely with gold. 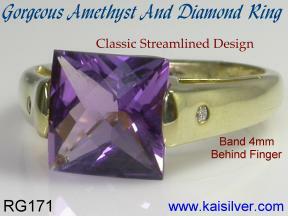 This narrow rim will protect the amethyst gemstone from side impact and add to the durability of the ring. The option will add to the gold content of the ring and the price will move up by just 75 U.S$. Every ring is handled by an expert craftsmen and we do not mass produce jewelry. The final touches are provided by flawless handfinishing and the ring passes through some of the most stringent quality checks throughout the production process. This ring is available with all gemstone options and you can mix and match the side gemstones too. If you need any gemstone or combination not mentioned in the tables below, please email us with details at sales@kaisilver.com You can also ask for all design modifications that you need and even send us images of your favourite designs to be custom made. Experienced designers and craftsmen at Kaisilver, answer all your queries and ensure that you are completely informed before making buying decisions. We do not hire sales staff and you will therefore not feel the pressure of being forced to confirm an order. 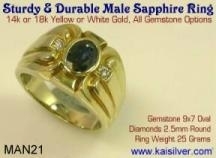 (01) The same ring can be made with good quality white sapphires instead of diamonds. This would lower the price of the ring by 80 U.S$. A very good suggestions, because the appearance of the ring will remain intact and sapphires are almost as hard as diamonds. You can also consider using other gemstones instead of diamonds and these would also reduce the price of the ring by the same amount. 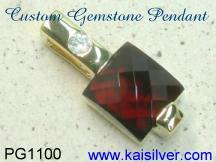 (02) Since all gemstone options are available, you can try some very interesting color combinations. For example, a large 8mm blue turqouise in the center and the diamonds replaced with high quality swiss blue topaz gemstones. 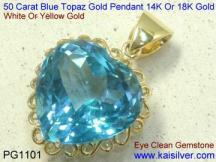 The serene opaque blue of the turquoise gem stone will look stunning against the crystal clear blue color of topaz. Another beauty would be a medium green jade in the center flanked by round emeralds on the sides. The turquoise and green jade will both be smooth (cabachon cut) gemstones. Try a square aquamarine gemstone in the center and replace the diamonds with good quality pink tourmaline gemstones. The possibilities are endless and you can let your imagination run wild. (03) Choosing white gold or yellow gold for your amethyst diamond ring. 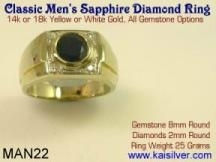 At Kaisilver both yellow gold and white gold are priced the same. The beauty of your ring will depend on the color contrast between the gold color and the gemstone color in your ring. For example, a very deep purple amethyst gemstone in a white gold amethyst ring, would make the gemstone appear almost black. This is due to the strong contrast between the white color (gold) and the very deep colored gemstone. Take this factor into consideration when deciding on which gold color to choose for your ring. You can choose the gemstone of your choice for this gorgeous ring. If the gemstone you need is not mentioned in the table below, provide us the details and we will give you a price quote for the gemstone option. 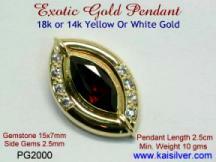 sales@kaisilver.com The price quoted is for the option with and without diamonds. In the cases where diamonds are excluded you can choose any other gemstone for the side gems. This ring can be ordered in 14k or 18k white or yellow gold, but we would recommend 14k gold because of it's hardness. White gold and yellow gold are priced the same. The final choice will ofcourse, be yours. The ring has a good gold weight of around 8 grams to 12 grams grams and this will ensure that your ring does not bend out of shape easily. The idea is to maintain a good gold weight across all ring sizes so that longterm durability is not compromised. Gemstone Size Details The center gemstone is of size 6mm or 7mm and the table below, provides size specifications in each case. The diamonds or gemstones on the side of the ring are round 2.5mm in size. You can choose to exclude the diamonds from the ring or replace the diamonds with any other gemstones of your choice. The amethyst diamond ring is priced the same for the yellow and white gold options. You need not limit yourself to the gemstones that you see in the table below, email us at sales@kaisilver.com with details of your requirements and we will procure and custom cut just about any gemstone that you need. 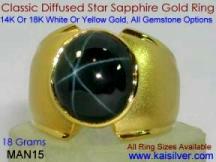 Why Buy Custom Jewellery From Kaisilver? 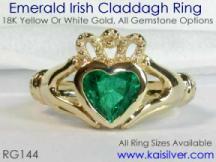 The Name You Can Trust: Kaisilver is the world's largest online provider of high end custom jewellery. Our buyers include fashion models, news readers, hotel and resort owners, members of the U.S and U.K armed forces, business professionals and doctors. We are directly networked to all the leading gemstone producers in over 15 nations. Over 3,500 skilled craftsmen and 5 of the best designers work on all Kaisilver orders. 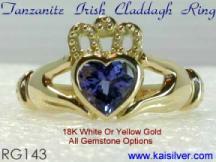 All our jewelry is custom made in 14k or 18k white or yellow gold. 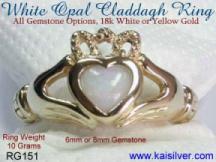 You can choose from yellow or white gold and all gemstone options are available. Since each piece is individually made, all design modifications are available. You can even send us images of your favourite designs to be custom made. Click Here to visit our custom jewellery section. Ordering, Shipping And Payment Information. We do not believe in rushing you through the buying process. We have worked hard to bring back the human touch to online selling and prefer that you clear all your doubts and queries before making a purchase. Our team of experts answers every email with clear precise answers and useful suggestions. The idea is to provide you with all the information necessary to make a well informed decision. Email us your questions at sales@kaisilver.com and we will ensure that you get relevant answers as soon as possible. We will not be bombarding you with sales talk as we consider ourselves to be more than just a jewelry seller. We are International Verified Premium Account Holders of Paypal and you can therefore transact with confidence. Our email for paypal is info@kaisilver.com and our support staff will be glad to help you if you need any assistance in making your payment through paypal. We also accept payments through Western Union Money Transfer, but please do not use this mode of payment if you are doing your first transaction with us. Most first time users of Western Union believe that any seller who accepts this mode of payment is bound to run away with their money! We have neither the time nor the inclination to make you change your mind and request you to use Paypal instead. Shipping will be within 4 to 5 weeks of order confirmation and receipt of payment. We need this time as every jewel is completely custom made and involves an immense amount of skilled craftsmanship. Every gemstone is handpicked and closely inspected by our gemstone experts before being custom cut. This is a time consuming process but, is the only way that genuine high end jewelry can be made. Your parcel will ship through FEDEX and we will provide you with the tracking number the moment it ships.